The CCFSA held their 13th Annual Family Champion Event on June 5th at the New Haven Lawn Club to recognize individuals across the state who have gone above and beyond the call of duty to strengthen and support families in Connecticut through their involvement with a family service agency. 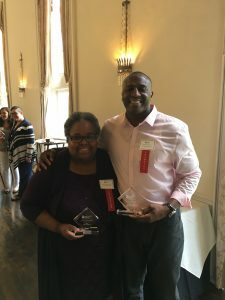 The CCFSA honored two of Klingberg Family Centers’ members: Natalie Lynne Smith and Timothy Conaway. Natalie Lynne Smith was brought on as a Board member 14 years ago when the Federation of Families recommended we have at least two consumer representatives on the Board. We immediately thought of Natalie, who had adopted one of our children. Natalie is a committed, reliable, helpful, supportive, sometimes mischievous, and always enthusiastic Board member. She is fully engaged both in and out of Board meetings, even enlisting her family to volunteer at our annual Vintage Motorcar Festivals. In 2014, she became the Board Chair, where she has worked tirelessly to streamline and facilitate Board functions. Timothy Conaway is a Youth Advocate for our Juvenile Justice Mentoring Program. He joined us only six months ago, but already he has made his mark. Tim works tirelessly with the young men in the Juvenile Justice Mentoring Program, meeting with them even in the evenings and on weekends to help them stay on task in school, build life skills, attend community programs, and engage in healthy, pro-social activities. The young men Tim works with have improved dramatically. Tim also works as a coordinator of a New Britain city-wide back pack drive in the fall and toy drive during the holidays and volunteers his time to the New Britain youth basketball league. We thank and echo the CCFSA in honoring these two amazing individuals for the work they do with us here at Klingberg Family Centers.